Many, if not most university and college dorm buildings in the northeast United States were constructed over a century ago. Therefore, it is not surprising to learn that many of these buildings have since developed structural issues that, in some cases, have required extensive renovations to correct. In addition to structural issues, many dorms and other old campus buildings have seen significant insect pest infestations over the years. For example, many buildings on the Harvard University Campus have been hosting large cockroach populations for decades. However, no dorm building in Massachusetts is more notorious for its insect infestations and structural issues than Wellesley’s Dower Hall. Although pest problems have been reported as occurring within Dower Hall for years, students living in the dorm today are protesting the administration’s lack of concern for the widespread termite infestation that has taken ahold of the dorm building. Considering that Dower Hall was originally built as a barn back in 1862 before being repurposed into a dorm decades later, termite infestations should be expected within the building. For the past few years, termites have been appearing in large number every spring and summer within the dorm. The dorm’s wooden floorboards have clearly sustained extensive termite damages, and this damage is most advanced within room 109 where termites regularly swarm through cracks in the floor. The dorm’s resident director has been dismissing these termite sightings as an unimportant insect presence that is to be expected within any old timber-framed building in New England. The termite complaints continued after a new student moved into room 109 after the first student left due to the conditions. The termites have also been spotted in the dorm’s bathrooms. The new resident of room 109 eventually learned to live with the termites, but after finding around 50 dead termites behind her desk as well as numerous living termites beneath the room’s carpeting, she called the campus police, which led to her room being fumigated for the termite infestation. Days after the fumigation, termites flooded into her room from a heater and from cracks in the walls. The resident also found that termites had eaten a hole through her closet floor, which gave the resident a clear view of the building’s basement. In response to this damage, officials have begun an investigation into the matter, but the termite infestation in the building may be too extensive to address with renovations. 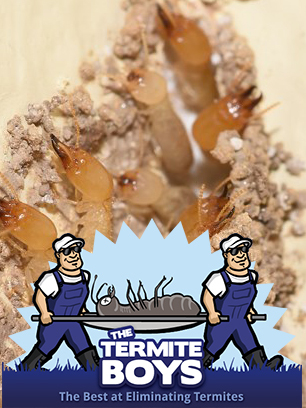 Have you ever found live termites indoors before?